With a name like Casper, you'd expect the town to have at least one good haunted location! While there are several other haunted places around the area, today's location I've chosen in the former Ivy House Inn, located on South Ash Street. The home was originally built in 1916, and construction officially concluded in the 1940 with the addition of the wonderful, grand porches. Many sources out there say that the home was built by Mr. and Mrs. W. Frank White, but I've found that not to be the case. However, the White Family did play a major role in the history of the home, and as you'll see a little later on, are the prime candidates for the hauntings! Rhea Eliza Porter was born on March 10, 1902. She and Willis Frank White were married in Salt Lake City, Utah on May 15, 1929, and as you might have guessed from that location, were Mormons. The White Family lived in various locations throughout Casper and Cheyenne during the 1930s and 1940s, but settled into their final home on South Ash Street between 1944 and 1945. Here it is rumored that the Whites hosted Mormon missionaries over the years. Together, the couple are listed in the 1940 census as having three children: Dale, Joe, and Charmaine. Frank may have also had at least one daughter, if not more children, from a previous relationship. It is said that Rhea ruled the home with all the strictness that her Mormon upbringing afforded her. She refused to allow drinking and smoking in her home and forbade any other type of immoral activity as well. After Frank passed away in 1957, Rhea continued to live in the home until her own death on May 15 1995 (her wedding anniversary) at the age of 93. The following year, the home was purchased by Tom and Kathy Johnson, who immediately began the task of renovating the large private residence into a cozy bed and breakfast. Almost immediately, strange activity began. Tom was working with a power drill when it suddenly stopped. He turned around and saw that the cord had not only been unplugged, but it was floating mid-air, as if someone was holding it up before letting it fall! Another time, a hammer mysteriously just disappeared. In paranormal research, we often associate an upswing in paranormal activity with any type of renovations, but the strangeness didn't stop even after the Ivy House Inn opened for business. The main entity seems to be that of Mrs. White. A female form has been seen walking down the hallway, a ghostly female face has been spotted in not just mirrors and windows but caught in photographs as well. Guests often report a knocking at their door at night, only to find no one there when they answer. Phantom smells are also quite common--especially those of chocolate baking and vintage cold remedies. The lower level of the home is no stranger to weird occurrences, either. Guests staying in one of two suites have claimed to have very vivid dreams of a young man who constantly paces back and forth between the sink and the closet area. Could this be one of the White sons? Before purchasing the home, Tom Johnson didn't believe in ghosts. However, with all that activity, he quickly became a little more open to the idea. In fact, he became a paranormal investigator! He and his son, Eric, gave tours and held annual October events in the home to share the history and the haunts of the Ivy House. They also held an annual party for Mrs. White and no less than nine official paranormal investigations were conducted. Unfortunately, opportunities to explore the hauntings for yourself are now limited to non-existent. 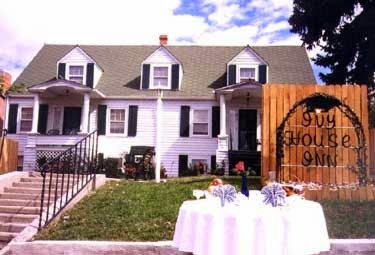 In 2009, the Ivy House Inn was purchased by The Self-Help Center and converted into Turning Point, a transitional group home for female victims of domestic violence.